What Makes this Ormus Minerals Charged Ocean Energy Unique? We start with pure distilled water and then charge the water so it is able to absorb more minerals when we do the Ormus process. Then we do a complete Ormus Mineral extraction process with multiple top quality know ormus source material. Next we wash the Ormus with charged distilled water again. After several washes this leaves pure condensed Ormus Minerals and in the final step we add our powerful Charged Sole and let the Ormus settle again and this final process we take out all the Sole and as much water as possible. 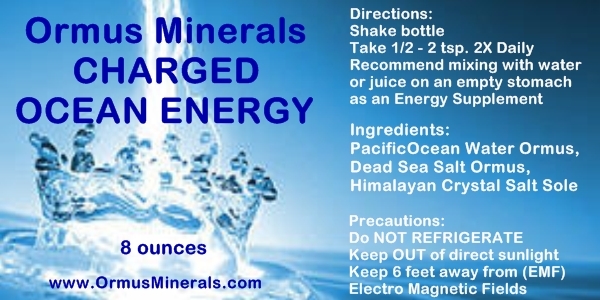 This leaves a very condensed and potent Ormus Mineral Product that has twice as much Ormus in as our regular Ormus Minerals Ocean Energy product.